Red eyes, or bloodshot eyes, is a common eye problem. It occurs when blood vessels in the sclera – the white part of the eyeball – swell or expand as a result of inflammation or irritation. Bloodshot eyes can appear without warning as a symptom of an injury, allergies or another eye condition. The severity of red eye symptoms can vary based on the underlying condition causing the red eye. It can cover the entire sclera or be limited to a few expanded blood vessels. Brief periods of eye redness are common and not usually a cause for worry. 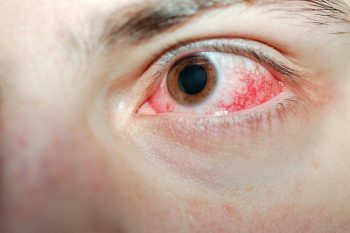 If red eye is persistent and results in eye pain or worsening vision, it could be a sign of a serious eye disease or condition that needs medical attention. If redness does not go away, you should visit your eye care professional to get a diagnosis of the condition and proper treatment. Anything that leads to irritation or inflammation can be considered a cause for red eye. Allergies are the most common cause for red eye. When the body releases histamine to fight allergens, it can enlarge blood vessels in your eyes and make them turn red and watery. Dry eyes can also cause redness. If your tear glands fail to produce enough tears to lubricate your eyes, the surface of the eye can become irritated. Contact lenses can promote eye redness if not worn properly or cleaned regularly. They can restrict oxygen and tear production in eyes and dry them out. Wearing them too long can cause surface debris and microbes to build up and cause infections and redness. Staring at a computer screen too long can also have a drying out effect and cause eye redness. Treating red eye depends on the root cause of the problem. Talk to your eye care professional and schedule an eye exam. They can diagnose what is causing your eye redness and prescribe proper treatment. Eye drops are effective in treating redness caused by dry eyes or allergies. Cold compresses can also be useful in reducing redness. Avoid rubbing your eyes. That can cause more redness and irritation and create cornea scratches. If you wear contact lenses, always remove them when experiencing eye irritation. Clean and replace them as instructed so you can keep your contact lenses from accumulating harmful bacteria.